Yesterday afternoon was spent with a few gents who find small streams, wild brook trout and nature a plus in this hectic fast paced world. We all agree that wild brook trout and those special places where they call home some of the best medicine one can take. This particular stream had its best face on. Sparkling clear cold waters, with a gravel bottom of many colors. As can be seen here there's so much more to this small stream angling. Mark the photographer getting close, with Steve and Kirk looking on. Steve trying to coax one to the fly. I fished only two flies this day and this was the most productive for me. Harry Murray's "Mr. Rapidan"
On this day I had the pleasure to bring a few wild jewels to hand.....I'm thankful. A beautiful spring afternoon spent with some buddies who can appreciate the simple beauty in "Brook Trout Forest"
A bright spring day was on tap yesterday, so Jeanette and I spent some time in the woods enjoying the the variety of flowers that are blooming. It seems everywhere you look you'll see them, some so tiny you almost strain the eyes. We also walked a small stream, one that has wild trout in its upper reaches. But this section is reserved for another wild fellow. Armed with a 2wt and a few dries I had a blast wrestling with the inhabitants of this stream. A few hundred yards upstream wild brook trout predominate. But here these guys are king. They are ever so scrappy on the 2wt, and do not care much what you offer them. Everyone is beautiful, especially when the sun hits their wet bodies. When we arrived home I had some dough and decided to make some stuffed bread. This along with a salad made for a great ending to a great spring day. This little woodland stream is in the top ten streams I fish. This time of year it's so much more enjoyable because of the absence of thick cover. 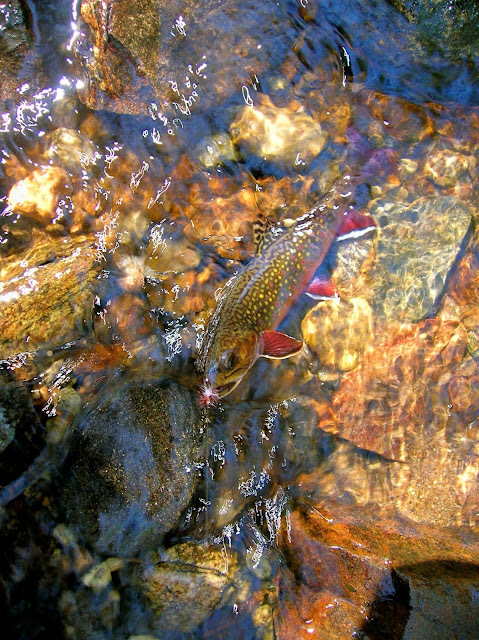 It holds wild brook trout only and they are willing to take a surface fly. The plunge pool here had a little run below it. 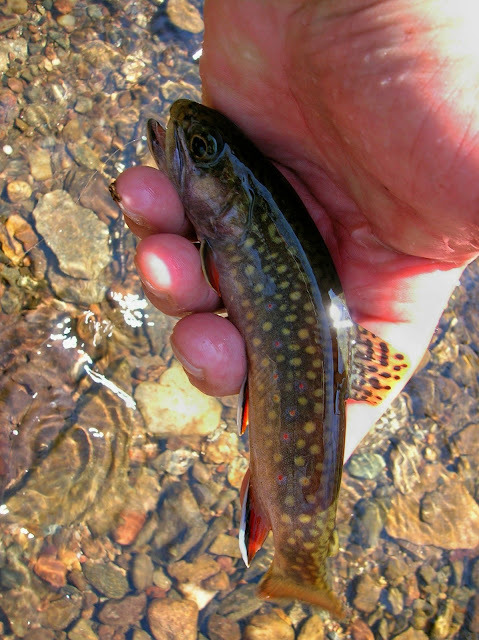 The brookies held in both sides of the stream as well as the middle. At one time I had a rise to the fly just as it hit the water. Starting to see more of these. I have about three more weeks of easy fishing before it's all filled in with brush. Then I'll have to really fight to gain access. A sample of the prizes this stream holds. Wild and clean. This stream will always be this way thanks to a few. The shape of this male is outstanding. I would love to catch him again come October. I purchased this book years ago because I enjoyed the concept of matching insect hatches with the timing of flowers blooming. The book is informative and easy to read, and authored by fly anglers. Small streams do have insect hatches, although not as prolific as larger rivers. The wild trout that inhabit these small streams are usually not selective and will eat anything that looks like food. Then again if you have a lot of one bug coming off the bottom and hatching it's most likely to catch someones eye, namely the trout. Yesterday I decided to test the idea out. Knowing that Trillium was about to bloom I carried a variety of March Brown flies. The book claims that Trillium and March Brown mayflies go together. 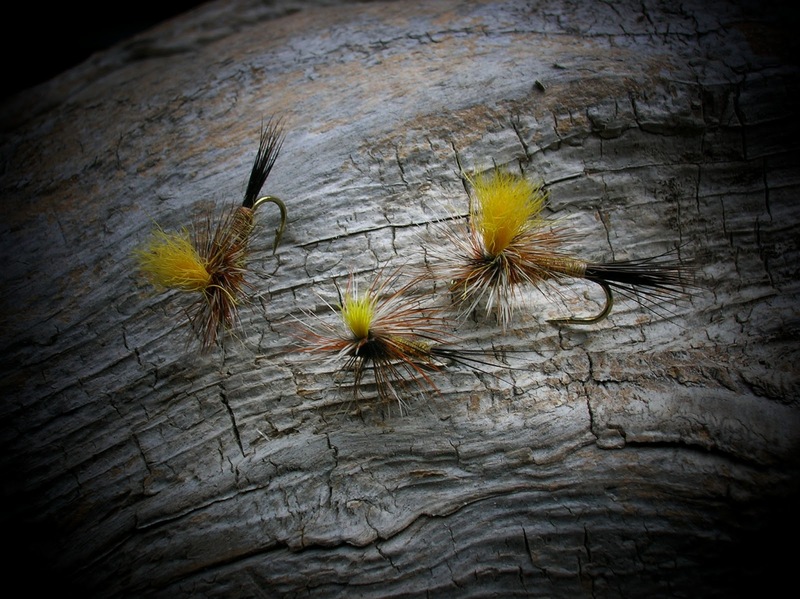 The patterns carried were Catskill style dries, a soft hackle wet, some emergers, and parachute dries. They were all of the basic colors of the March Brown. The Trillium was in bloom, and they were beautiful. Later in the afternoon I noticed a few flies in the air and tied on the Catskill dry. The fly was not taken, even with a long tryout. The soft hackle produced a few hits and one nice brook trout. Next the emerger was tried and it brought several nice fish to hand. But the parachute March Brown was the best. They really attacked it. The assortment of March Brown look a likes. Is there something to this "Trout Flies and Flowers"
Saturday I fished a small blue line, one I haven't fished for some time. The early morning rain gave a sparkle to the woods and the new greenery seemed to glisten. Wet spring woodlands have a smell that is hard to describe. Hemlock and fern mixed with flowering bushes along with damp earth combine to hold an angler captive. It did not take long for the Picket Pin to strike. The brook trout wasted no time chewing the fly. I had several hookups but they resulted in short distance releases. The fish seemed to be holding in the faster currents. Several more strikes later I had the pleasure of my first brookie to hand. He would be the first of many. Take notice of the full bodied fly in his lip. Spring woods. A Trillium wet with rain lies sleeping, waiting for the sun to wake it up. This wild flower is one of my favorites, and in the trips ahead I will take many photos of its beauty. In this run, along the debris of wood, and leaves. The fly started to slow and hang in the current. In a heartbeat hell broke loose. Moments later I held this handsome wild brown. He was so heavy with spots they seemed to jump out. Take note of the fly, it's getting thinner. This photo represents a thin blue line. A wild trout stream. This is one of my favorite places on this stream. It is brook trout forest. And it is in this section that a wild jewel was to come to hand. Not much peacock herl left on the fly. The fly of the day. A Picket Pin, tied without hackle. This allows the fly to ride deeper in the water column. The third Saturday in April has always been the opening of trout season in Connecticut. It's a day of family fishing, old buddies getting together for a Spring tradition. A time of camping, early rising, coffee from the gas station, or loading up on carbs and cholesterol at the diner. They are the days of catching breeder trout, some of which can be quite large, and days when your children catch their first fish, and those days of standing in cold streams, shoulder to shoulder with other anglers waiting to fill there limit. These days provide memories that will last a lifetime. So if you have the time, get out and make a few memories and enjoy. For me opening day will start with a cup or two of Nantucket, black and hot. A bowl of oatmeal, with maple syrup and blueberries. I'll then find a small cold clear freestone stream to fish. Armed with a 2wt rod and a few flies I'll seek out the wild brook trout. With a little luck I'll be graced to bring to hand a few wild jewels. While out there be on the lookout for some land based wild beauty. This could be the weekend for these. Fishing small streams over the years I have encountered many wild creatures. Some of which have been rare and some pretty common. Here's one that is common and rare at once. While driving to the parking area of a stream I saw two wild turkeys on the edge of the road, very common this time of year, it's what they did next that was very uncommon, at least to me. They were gobbling very aggressively at my car. At one point they attempted to chase a truck traveling in the other direction. This continued for some time until one started for the woods, soon the other followed. They continued to gobble as they left. A beautiful spring morning. The stream was in great shape, and a few bugs in the air. This is a place I never overlook while fishing small streams. Shallow riffles flowing into somewhat deeper water. Such was the case today. The wet fly drifted through and was taken by a feisty wild brookie. I came upon these all clumped together. Looking closer I noticed some yellow flowers just about to bloom. Another one of those shallow riffles. The fish was lying in the soft seam. It didn't take long for the fly to be eaten. 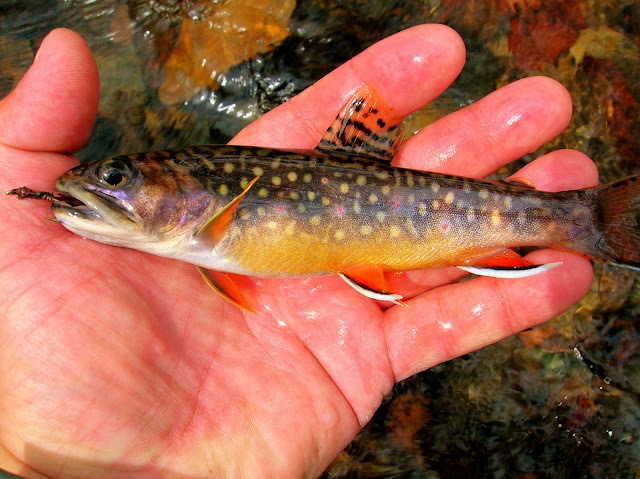 All brook trout are beautiful no matter what season they're taken. But this one was stunning. When first lifted from the cold waters his colors were so vibrant. It's to bad the camera can't capture them. More colors of new life, growing through the dead remnants of winter. Saturday morning Jeanette and I took a walk in the woods and along the waters that are the domain of the wild brook trout. The forest road that brought us to the trails that gave us access to the streams. We spent several hours walking and observing the new season coming to life. In the stream I saw several brook trout, and heard the wild turkey gobble. A fly rod was not in hand this time, only a camera and the mind, both taking notes of the day. 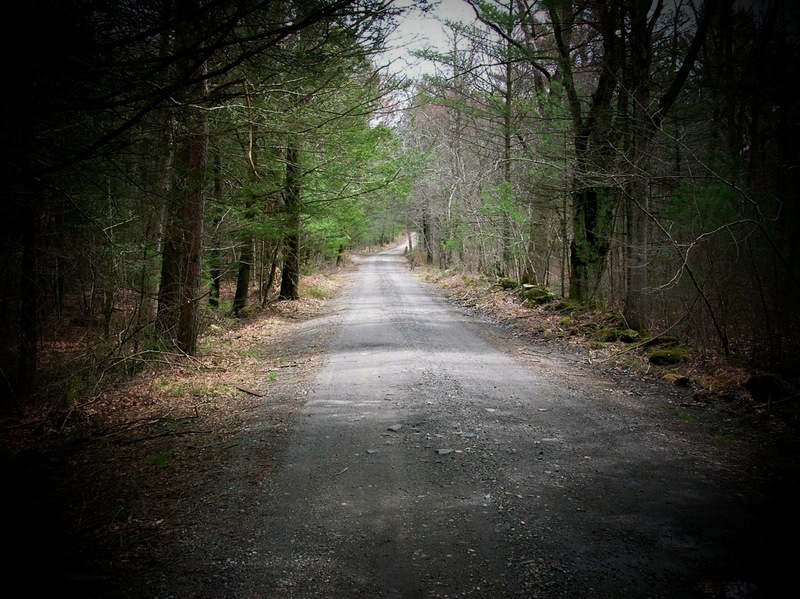 I will return to these woods again and walk and fish for the brook trout. To take time to see all that beauty that is the woods and streams.